The preservation of historic properties has not always been met with enthusiasm. Money often trumped civic responsibility in real estate developers’ actions. In February 1965 New Yorkers watched in horror as workers were paid overtime on a weekend to begin demolishing the monumental Brokaw Mansion at Fifth Avenue and East 79th Street, thereby avoiding the possibility of a court order to stop work. In the summer of 1980 the Metropolitan Museum of Art aggressively sought to acquire for its American Wing the magnificent Art Deco bas-relief sculptures that adorned the façade of the doomed Bonwit Teller Building. To avoid the time-costly process of carefully removing the works of art, the developer ordered them jackhammered to pieces. By 2010, however, most New Yorkers were secure in assuming that such artistic, historic and architectural barbarism had been left in the 20th century. They were wrong. In the decade before the Civil War the Lower East Side along East 6th Street was still an affluent residential neighborhood. Up-to-date Greek Revival residences were being constructed for the growing financially-comfortable merchant class; like the one at No. 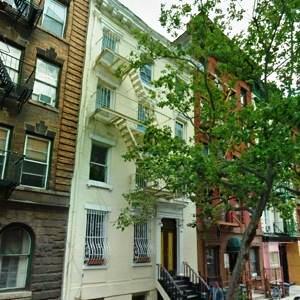 331 East 6th Street. Completed in 1852, the red brick home was a roomy 25-feet wide, stretching back 100 feet to the rear garden. 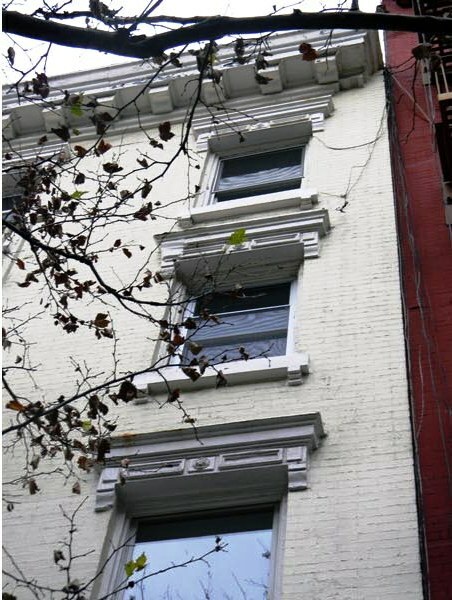 Sitting high above a brownstone stoop over a deep English basement, the double-doored entrance was framed in sturdy brownstone Greek Revival pilasters. A dignified pressed-metal cornice with simple brackets crowned the façade. The line of nearly identical homes along the block, built on speculation, was broken by the architecturally-harmonious St. Mark’s Lutheran Church built nine years earlier for the growing German population of the area. As the century ground on, the neighborhood filled with more and more Germans, earning it the name Kleindeutchland, or “Little Germany.” German social halls and churches sprung up and The Bowery was the center of night life, with numerous German beer gardens and dance halls. Tenement buildings for the poorer immigrants replaced former residences. But the house at No. 331 remained unchanged. Hugo Ohlhorst lived here in his father’s house in 1887. The young man was a cutter in a downtown tailoring shop and the senior Ohlhorst was a wealthy merchant, according to The Sun. On New Year’s Eve that year the house was to be the scene of a wedding. The Sun reported that “There was to have been a merry party and a wedding…last night, with afterward a feast and a dancing of the old year out and the new year in at a ball up town.” But it was not to be. In the meantime, Hugo’s bride-to-be, 19-year old Rose Scherer (The Sun described her as “very prepossessing”) put on her wedding dress and appeared at the Ohlhorst house as the other guests were arriving. At the saloon, things escalated and the three men took their argument to the street. In the ensuing fight, Loenberg’s leg was broken, he was cut under the eye and was found by police on the sidewalk unable to get up. Cohen and Ohlhorst were arrested for assault. An hour after the guests had all arrived, word came that Ohlhorst was in jail, “shedding tears and bemoaning his fate,” according to The Sun. Rose returned home in her wedding dress, crying; the guests departed quite unsure of how to spend New Year’s Eve, now; and Hugo’s stern German father was extremely displeased. “Mr. Ohlhorst said it was a shame that his son should act that way, especially on his wedding night, and decided to let him sleep in the station house instead of in a bridal chamber,” reported The Sun. In 1973 a day care was started in the basement of No. 331, where the former social club had been. But the 1970s were a dark time for the East Village. The German population had long since moved northward to the Yorkville area and drugs, crime and squatters filled the side streets. Early on the morning of October 4, 1979 police executed a raid at No. 331 on the apartment of 29-year old Susan Shinkarik. The apartment was the “factory” of a drug ring and officials seized fake prescription forms, firearms, printing equipment, quantities of narcotics, forged credit cards and drug paraphernalia. The raid resulted in the arrest of two other persons as well, and gave police reason to search Martin Newman’s apartment in the building, as well. There they discovered a “large cache” of drug-related materials, as well as hashish, opium, handguns, amphetamines, marijuana and barbiturates. It was the low point in the life of No. 331 East 6th Street. But, as with every New York City neighborhood, things change. The East Village underwent its rediscovery in the 1980s and 1990s and by the turn of the century trendy restaurants and shops replaced the seedy bars and head shops. And property values rose. The “endless possibilities” envisioned by former “Friends” star David Schwimmer were, perhaps, different from what those living in the neighborhood had in mind. The actor purchased the house for $4.1 million in 2010. In March and May of 2011 the Landmarks Preservation Commission notified the new owner that his house would possibly receive landmark status by the end of 2012. Schwimmer acted swiftly. Four months later the house was gone. many thanks to Daniel Boyar for bringing this property to my attention. Where is the coordination between the department of buildings and Landmarks when demo permits are given out? How does a notable building contributing to a landmark district get demolished simply to avoid a pending hearing with the landmarks commission? The word weasel comes to mind. Disgraceful. Also a fine example of someone with too much money and no class or sense of history, deciding that they can do whatever they want.